Many Katahdin Cedar Log Homes are designed with attached pergolas, porches and decks. Adding sun blinds is an ingenious way to add privacy and control solar exposure to expand your outdoor areas. One Canadian company, Pylex, developed this system using their unique hardware system, that’s customizable for just about any location. Pylex manufactures their sun blinds louver system hardware to allow for flexible design and applications both vertically and horizontally. The system consists of a series of brackets that are attached to the ends of boards then attached in series along a cross beam or post. Each kit will set up 11 boards, with 44 boards usually making up a complete pergola. The louver boards can be any material that will perform well in outdoor sunny environments. 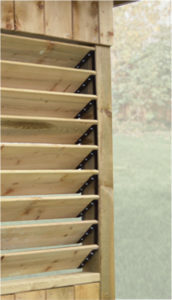 Our experience with cedar boards make cedar an excellent choice for these louvers. The cedar boards can be stained and sealed with the same finishes as your cedar log home! Other options include composite decking, pressure-treated or other stiff, weather-resistant boards can be used. While the boards can be cut to any length, Pylex recommends keeping the sun blinds louver length to under 6 feet for best results, with a width of 6 inches and thickness of 1 to 1-1/4 inches. Because these Pylex sun blind louver kits are so versatile, they can be used in many different applications. When installed vertically on fence posts, they can be opened to allow a breeze through to cool a deck area, providing privacy when closed. When mounted on top of a pergola, they can be manually adjusted to create more shade or allow sunlight to filter through. Another great application for these louver shades is to increase privacy and shading on a deck or porch gazebo. Installing these sun shades on the western side of your gazebo allows guests to enjoy the outdoors without being blinded by the sun’s late afternoon glare. If your hot tub or spa needs just a little bit more privacy at times, these sun shades can be adjusted to block views or allow breezes through. Wintertime spa activities can be sheltered from the wind with a simple adjustment. The hardware for the sun shutter louver systems is made of steel finished with a black powder coat. 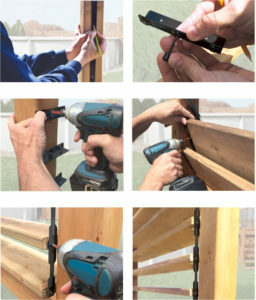 The pergola installation guide for example is quite complete and includes specific directions, templates and illustrations to guide the assembly. Other elements including stanchion brackets, post brackets and other hardware are available through the Pylex line. 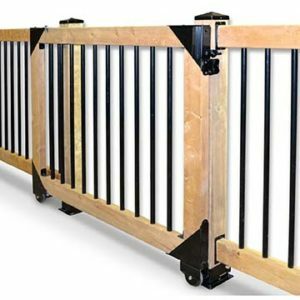 If you need a gate for your deck to protect small children or animals, Pylex has an easy sliding gate hardware kit (below) to complete your deck or porch. 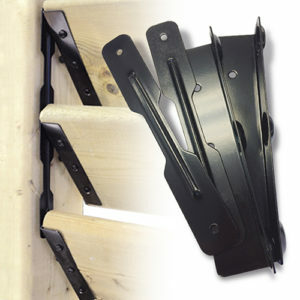 The heavy-duty hardware is adaptable for barrier frames up to 72 inches wide and can be constructed with cedar planks to match your deck rails. You’ll want to show your dealer these ideas so that he can include specific cedar louver or gate boards in your kit shipment.